This weekend’s Austrian Grand Prix is a great chance for Ferrari to really take the fight to Mercedes.Ferrari made a genuine step forward in performance at the last race in Canada thanks to some upgrades to their engine, but this was not really seen because of the problems that hit Sebastian Vettel. The four-time champion started only 18th after suffering an electronics problem in qualifying, and then a grid penalty. But it was obvious from his strong recovery to fifth place in the race that he had some genuine pace. I think he could have given the Mercedes cars something to think about in Montreal and, given the similarities between the two tracks, the same should be the case at the Red Bull Ring. Vettel’s team-mate Kimi Raikkonen qualified 0.6secs behind Lewis Hamilton’s pole position time but only 0.3secs off the second Mercedes of Nico Rosberg. Throughout the season so far, Raikkonen has been around 0.3-0.4secs off Vettel in qualifying, so that would have put Vettel in a battle with Rosberg for a front-row spot in Canada. Rosberg spent most of the race in Montreal about a second or so from Hamilton, so that suggests Ferrari have a good chance to threaten Mercedes in Austria. I don’t, however, expect Ferrari to be able to challenge Mercedes everywhere. In fact, I suspect the story of the year will end up being that Ferrari will be a threat to Mercedes – even beat them sometimes, as they did in Malaysia in March – on some tracks that suit them better than the world champions, or when one or both of the Mercedes drivers makes a mistake. Austria is a low-grip track and it’s easy to make a mistake there – just as Hamilton did in qualifying last year, for example. Last year Williams were the team to pick up the pieces. This year it will be Ferrari. What has happened to Williams? Williams started this season with a great deal of expectation on them after a strong finish to 2014 but they have not quite delivered. 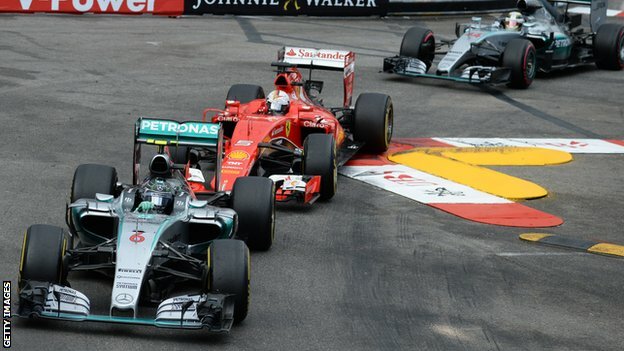 Instead, Mercedes have stretched away and Ferrari have leapfrogged ahead. A lot of that is to do with resources. Williams are a long way behind Ferrari and Mercedes when it comes to budget and Ferrari poured a lot of money into making progress this season after a very disappointing 2014. Williams had a strong 2014 but it came on the back of a run of bad seasons. They have put a new group of people together and I think they have focused on having a balanced, solid approach to this year, to try to build on the steps they made last year. Their pace profile has been very similar to last year – they’ve been good where they were last year (such as in Canada) and struggled in the same places (especially Monaco). What they have done differently is convert their speed into results a lot more successfully than in 2014, when it was early summer – Austria, in fact – before they started to get the points their speed deserved. The other thing to bear in mind is that the extra funding that comes from finishing third in the championship last season does not really kick in until later in the year, so they could be even stronger in 2016. Nico Hulkenberg has had a good past week or so. Canada was the first race this season at which the German properly got on top of Force India team-mate Sergio Perez and he scored some solid points in eighth place. He went straight from there to Le Mans, where he won for Porsche on his debut at the 24-hour race – becoming the first active F1 driver to triumph in the annual event since Johnny Herbert in 1991. That is a fantastic achievement. Le Mans is tough for anyone because it is so different from any other event – to race solidly for 24 hours. For a novice, it is especially hard. When I won my first Le Mans, in 1998, I was in a very similar position to Hulkenberg. I had competed in 1997 but the car I was in only managed eight laps before retiring, so 1998 was effectively my debut. Hulkenberg’s three-man crew, also comprising Englishman Nick Tandy and New Zealander Earl Bamber, beat the average age of our crew 17 years ago – myself, Laurent Aiello and Stephane Ortelli – by just six months. Hulkenberg acquitted himself extremely well on his first trip to Le Mans and it was a win that had to be earned, because the competition from the other two Porsches and the Audi team was very strong this year. But the key driver for them was Tandy, who effectively won them the race by being the quickest guy through the night. The number seven Audi set the pace during the afternoon and evening of Saturday and got into the lead, but after midnight the Audi lost some pace and the Hulkenberg/Tandy/Bamber Porsche was incredibly quick. The cooler conditions also enabled the number 19 car to go to four stints on one set of tyres, which was an advantage Audi had during the day, when the Porsches could manage only three. Tandy was more or less unknown until this weekend. A year ago, the 30-year-old was racing in the Porsche Supercup in Germany – ironically for a team run by Timo Bernhard, who was one of the three drivers in the Porsche that finished second at Le Mans, along with Mark Webber and Brendon Hartley. Until Le Mans, Tandy had had a really difficult time this year. At the Daytona 24 Hours, he crashed into his team-mate. Then in his first race in the Le Mans Porsche, at Spa last month, he had a very similar situation, crashing into the factory Porsche GT car. So he will have gone into Le Mans knowing he had to be on his best behaviour, but he really delivered when it mattered. As for Hulkenberg, they say good things come in threes, and I think there is every reason to believe he and Force India can have another solid weekend in Austria. For one weekend in June every year, Le Mans is the biggest live sporting event in the world – 265,000 spectators made the trip to the Circuit de la Sarthe. It is one of motorsport’s three blue riband events, along with the Monaco Grand Prix and the Indianapolis 500. And it will have that status for as long as there is a race. But it is pointless trying to compare it with F1, or to try to argue one is “better” than the other. They are completely different events, based on a different philosophy and a different rule book and they are not meant to be compared. Le Mans has variety, with lots of different types of cars racing at the same time, and sports car fans love that. There are lots of different categories, and even within the categories the cars are very different. For example, of the cars in the headline LMP1 category, the Porsche is a four-cylinder turbocharged petrol engine, with a hybrid system that produces eight megajoules (8MJ). Audi runs a 4MJ hybrid system on a V6 turbo-diesel engine. And Toyota has a normally aspirated V8 petrol engine with a 6MJ hybrid. The cars are very exotic and extremely advanced technically. And those three cars – Porsche, Audi and Toyota – generally race very competitively, which demonstrates how successful the FIA has been in creating an equivalence formula. F1 has much more technical homogeneity, which is not necessarily the right way to go. I believe it should be the pinnacle of technology – which it is not at the moment because it is being restricted for other reasons. But it has a global audience that is far greater than Le Mans and that is always likely to be the case, because it is a much more appealing product for a general sports fan. F1’s biggest problem at the moment is that it talks itself down. Yes, Canada was not the greatest race there has ever been. But you can’t have a brilliant race every time, just like not every football match is a seven-goal thriller. Sometimes people expect and ask too much. F1 has areas it needs to improve but it would run a lot more smoothly if people kept things in perspective. And that includes us in the media.